There was never a more astute chronicler of the hits and near-misses of love than Jane Austen. Now, she helps readers discover their inner heroines and get the guy in this witty book of romance and dating strategies. A completely new and amusing approach to dating, Jane Austen's Guide to Dating includes insightful personality quizzes that reveal which Jane Austen character you, and your mate, most resemble. Armed with this knowledge, you can learn what to do if you're a Lizzie, but the object of your affection is a Bingley. You can even find out how to gain the clear headedness and confidence that Anne Elliot had and almost lost in Persuasion. 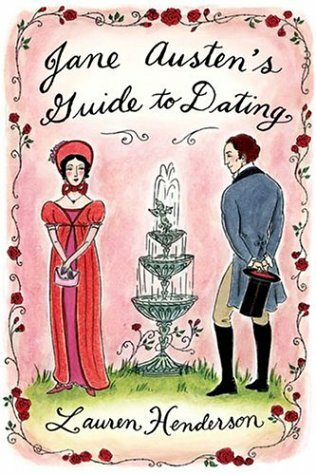 Full of wit and truly useful advice that has stood the test of time, Jane Austen's Guide to Dating will help readers overcome the nonsense and find the sense (and sensibility) to succeed in a lasting relationship. Fans of Jane Austen and newcomers alike will delight in this fun, fresh, and audacious guide. I guess I'm lucky to find this book in a local used books bookstore in the courtesy of Jane in June. I enjoyed reading it tremendously and never thought that it is actually a self help book and dating guides! The book has ten chapters. Each chapter is likely a rule. In one chapter it highlighted the point that you should not play hard to get and try to appear hard to resist. 1. If you like someone, make it clear that you do. 2. Don't put your feelings on public display, unless they're fully reciprocated. 3. Don't pla...more I enjoyed reading it tremendously and never thought that it is actually a self help book and dating guides! The book has ten chapters. Each chapter is likely a rule. In one chapter it highlighted the point that you should not play hard to get and try to appear hard to resist. If you like someone, make it clear that you do. Don't put your feelings on public display, unless they're fully reciprocated. Don't play games or leads people on. Have faith in your own instincts. Don't fall for superficial qualities. Be witty if you can, but not cynical or cruel. Be prepared to wait for the right person to come along (my favorite chapter). If your lover need a reprimand, let him have it. I was startled when I saw there's actually a quiz at the end of the book to see what kind of heroine you are and a summary of all Jane's novels, and character analysis of romantic character. Believe me I think I'm Emma type! Hah, funny how things like quizzes really affect me how I want to be one of Jane's heroine! The dating's guide is somewhat hilarious and gives you some best of ideas for a modern type dating base on over 200 years old legend publication of romance fictions. Which I also come up with a conclusion that it is OK to be who you are. Only, you have to follow the chapters #6. There is no rules you should follow, the #0, which there is no rule. If all the 10 rules can't be use or irrelevant, just stick to the rule #0. "Are you a Jane Austen fan? Do you think she had it right?" My answer; Yes she had it right. She lives in different era but she's still alive in every woman's heart. I even think she could be a Professor in Literature if she's still alive. Just saying. So, do you think she had it right? yes, definitely interesting chapters and judging from the ten chapter titles, i agree with you. jane austen got it right when it comes to women and finding love. I don't need a dating guide, but this book sure does sound sweet! Just returning the hop. I like the titles for the chapters. Happy reading! Hi Darlyn, Thank you for stopping by on the BBH.I have been to Malaysia - Penang. Jane AUsten was an amazing author -- her characters are as relevant today as they were during her time. I think the hop is a marvelous way to meet bloggers both old and new. Thanks for stopping by my blog! Ha! I'm definitely going to have to pick this one up. Maybe it can make it onto next year's schedule. I love this book! I have had it for a few years and I still read it every now and then. I have bought it for friends and used it at girl gatherings as a party game (really is easy to turn the q's into fun talk)! Hi there! Thanx for stopping by at my blog! I love your blog and great review! I'm a sucker for good covers and this is definitely a good one! Those are great tips, Darlyn. I'm a big fan of #2: Don't put your feelings on public display, unless they're fully reciprocated. Very true. This sounds like a perfect book I'd love to read. I love tip #9 too: Be prepared to wait for the right person to come along. Yes, Jane Austen definitely had it right. She, too, is a heroine of mine. I read Pride and Prejudice and loved it. My daughter has read all of her works and loved every one. I'll have to tell her about the poems because I don't think she knows about them. This was new to me, too. Thanks for sharing this bit of information about Jane Austen. I've found my Austen hero already, but I might have to pick this up anyway, you've made it sound so fun! Great review! LOL, I didn't know there was such a book! I might check it out for the fun of it. haha!